Remember when becoming a great hitter used to mean chasing balls, searching for an open ball field to hit live pitches, or spending dollar after dollar at the commercial batting cage? The Power Alley Home Batting Cage allows you to hit ball after ball without fear of breaking a window, denting the car, or hitting the ball into your neighbors yard. The Power Alley is so convenient to set-up and use, you’ll improve your batting average at home in just a matter of days! The secret is hitting time . . . Most hitters spend 68% of their hitting time searching for a place to hit and chasing the balls in the outfield once they do. Studies also show that most hitters rarely hit more than 50 pitches in any given hitting session. And because the PowerAlley is set-up and ready for you to use at home so you don’t have to spend time looking for a place to hit. The Power Alley is so compact, you only have to walk a few steps to retrieve the balls and start hitting again. Built for ease-of-use and durability the PowerAlley sets-up in minutes. 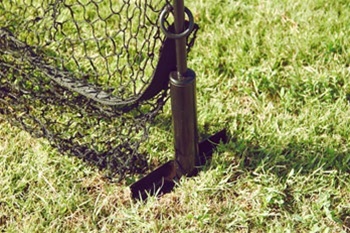 The unique fiberglass pole design, strong 1” nylon netting, and steel ground stakes provide unusual strength and support along with the flexibility to withstand the elements. 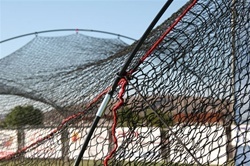 Measuring 22 feet long, 12 feet wide, and 8 feet high the PowerAlley is the smartest batting cage for home or club use. Simple to set up and sturdy enough for any backyard need. Good option in the low price area.